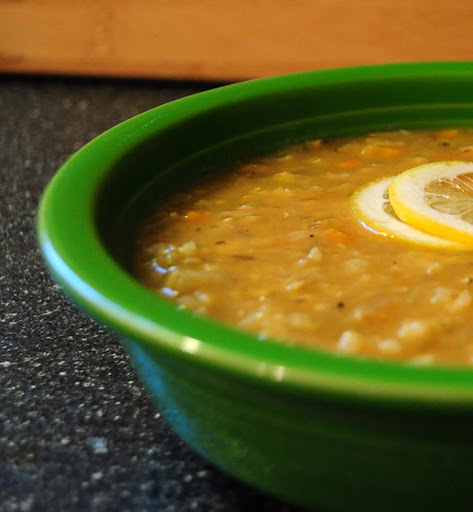 Arabian Lentil & Rice Soup a la Appetite for Reduction – Is It Vegan? A friend recently alerted me to the latest cookbook offering by Isa Chandra Moskowitz, Appetite for Reduction. Her latest release is a collection of low fat, lower calorie vegan whole food recipes that are just begging to be made. Much like Veganomicon, this book is filled with recipes using real food….beans, rice, vegetables, broth. Sure, there’s a few tofu and tempeh recipes, but the gist is this….you don’t need a freezer full of fake meats to have a satisfying home cooked vegan meal that is both healthy and as the name suggests, low in fat and calories. Autumn in New England means a chill in the air and more than a few rainy days. I had a bag of red lentils that were calling from the pantry and this soup seemed like it would hit the spot. I made a few adjustments, as a home-cook tends to do. First, I had no coriander (Someone add that to the shopping list.) so it was omitted. And second, I went way less on the garlic. I’m expecting my first child any day now, and garlic is not this pregnant lady’s friend currently. I’m sure we’ll make up some day soon (please let it be soon!) but for now I decided to use one large clove, chopped in large chunks. This produced a more mellow garlic flavor that I could handle. I really liked this and it came together very easily. Its not fussy and doesn’t require a lot of attention. Also, seems like a great recipe to make on a Sunday and enjoy during the week for lunch. Preheat a 4quart pot over medium-high heat. Saute the onions on the oil until translucent (4-5 mins). Add the garlic, salt, pepper, and saute for another minute. Add the spices and stir continuously for about 15 seconds to toast the spices and coat the onions. Add the carrots, lentils, rice, zest and broth. Cover the pot and bring to a boil. Once boiling, stir and reduce heat to a simmer. Cover and cook for 40 or so minutes – until the rice is nice and tender. For a thicker consistency I let mine go for an additional 10 mins uncovered. Or for a thinner more broth-y soup, just add more water. Taste for seasoning and adjust with salt and pepper, then add the lemon juice. Or if you’re me, you’ll squeeze some over the top of your bowl and enjoy. Looks like a great soup recipe. Never can have too many lentil recipes! Excellent soup! I used 3 cloves garlic and a added a few handfuls of shredded cabbage. Yummy.